Last weekend we went for a two-day tour in Skåne. We wanted to have the opportunity to test the gear we intend to use for our Iceland trip this summer. As we already have walked most of the shorter trails around our hometown we looked for a suitable trail in the southern parts of Sweden. After some research we decided to hike the coastal walk around Bjärehalvön. This tour fitted us good as it was a circle walk giving us the possibility to start and end at the same spot without needing to backtrack any part of the hike. It is 52 km long, making it ideal for a two-day trip as we know that we usually walk at least 25 km per day. The hike is split into four parts, each 10 to 18 km long so we decided to walk two parts per day. 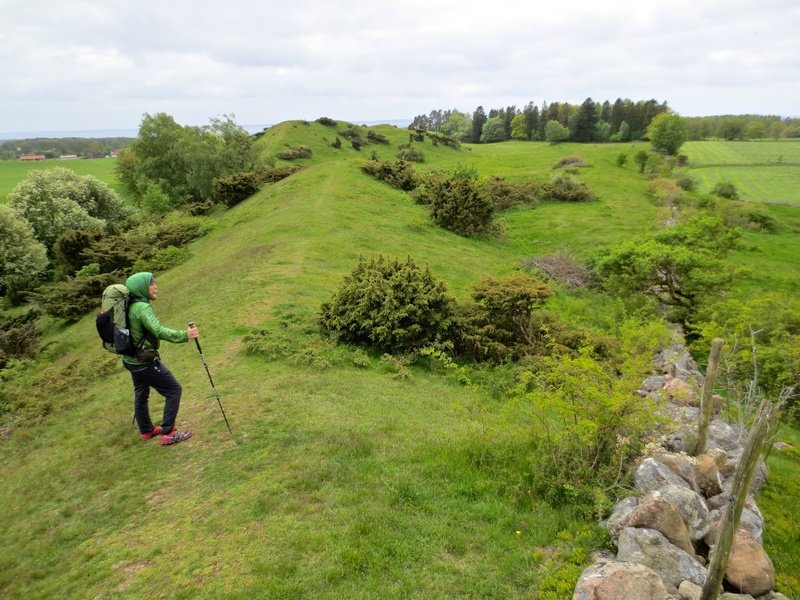 We opted to start from Båstad on the northern part of Hallandsåsen and walk the trail clockwise. So the order for each part would be 20, 17, 16 and finally 15 back to Båstad. We started of from the city centre around 11 o clock on Saturday. We headed southwards out-of-town and quickly the trail started going upwards onto Hallandsåsen. The temperature was around 10 to 12 °C and the clouds looked like we could get some light rain. We were soon on top of the hill and could enjoy quite view over the landscape consisting of rolling hills dotted with forest groves and small farms. Unfortunately much of the track followed asphalt roads that we hade to share with motorized traffic. Midway we took a short stop in a small beech wood and rested our legs. Walking on hard ground is not the best option. After this the path went down towards the southern shores of Bjärehalvön. We still had to walk on roads but the views made the walk worth it. Jon overlooking the Eskers outside of Grevie. 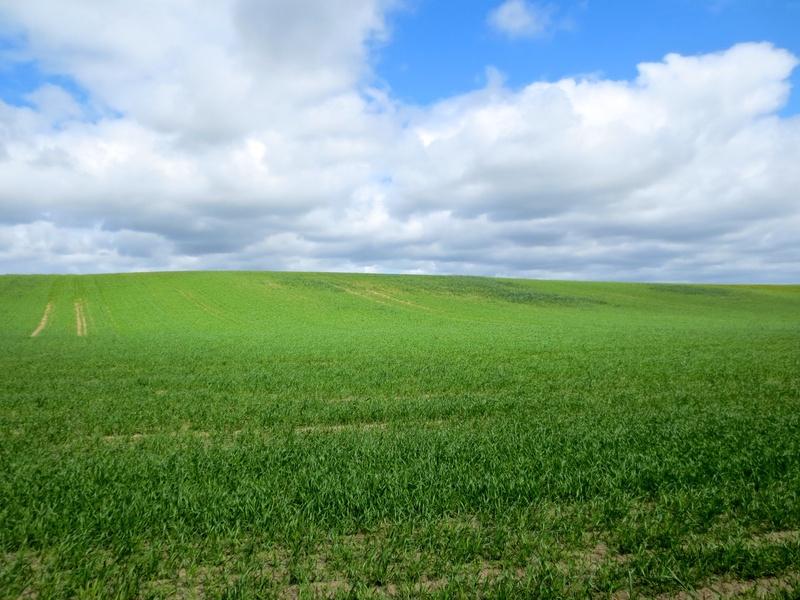 No, this is Skåne, not a Windows wallpaper! Closer to the shore we crossed a beautiful small nature reserve stretching over a Esker giving us a pause from the roads. Not long after this we finally arrived at the sea and Ängelbäcksstrand. By now the Sun began to show and the views around us were stunning. It had been a fairly ok walk down the countryside but now things started to look very promising! 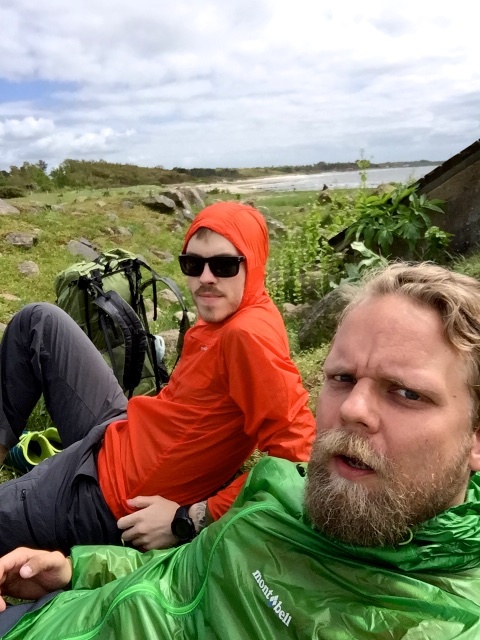 If our calculations were right we thought that we would have time to walk to Torekov before it was time to make camp. 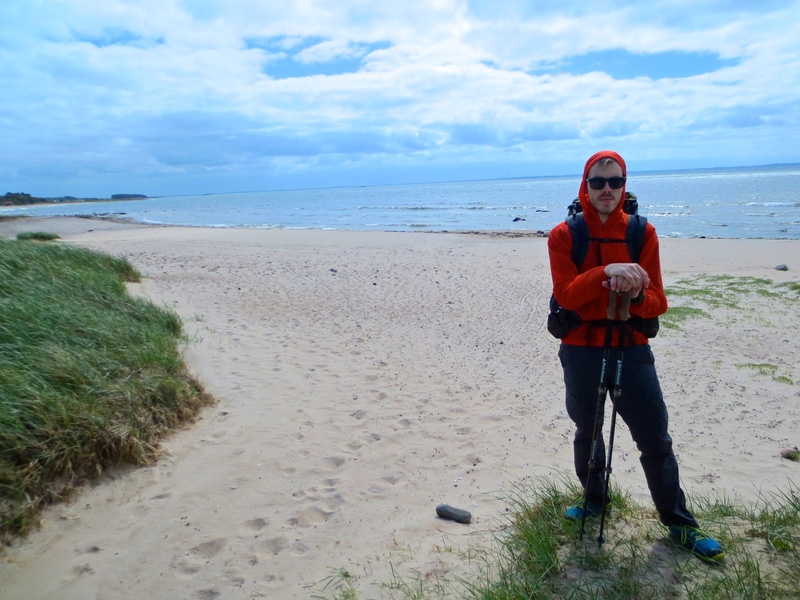 So we started walking north along the beach after a short pause. 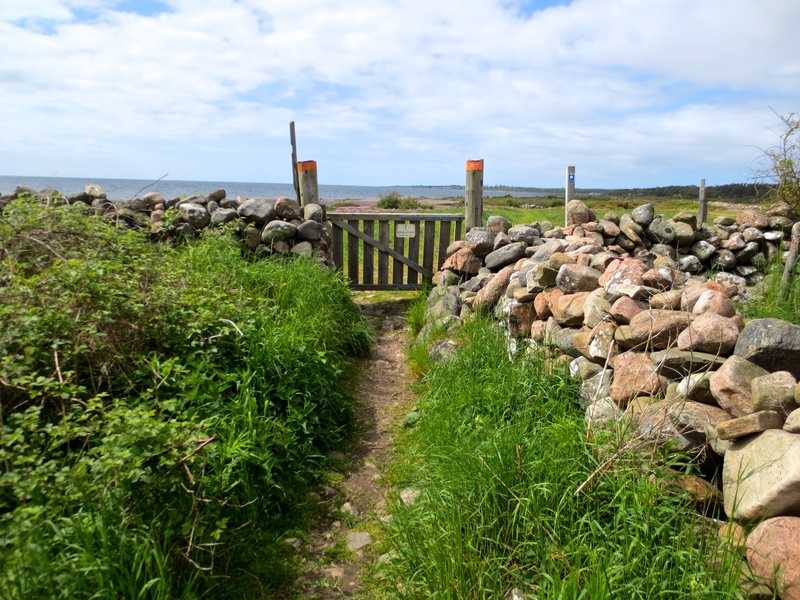 The trail along the beach showed to be nothing less than fantastic! All the way up to Torekov we walked in pastures along the coast line. There were hardly any buildings except for the old bunkers built during WW2, now left closed for future generations. We kept a good pace during the whole walk up to Torekov. The fields held plenty of livestock; both cows, horses and sheep and we had som close encounters with all three. Luckily the beasts were satisfied with their herbivore diet and didn’t show any interest for Cuben or Pertex. A swan nesting in the reserve. Sometimes you just have to wait for the traffic to pass before you can go. Later in the afternoon we arrived at Torekov, a picturesque tourist town at the western end of the peninsula. 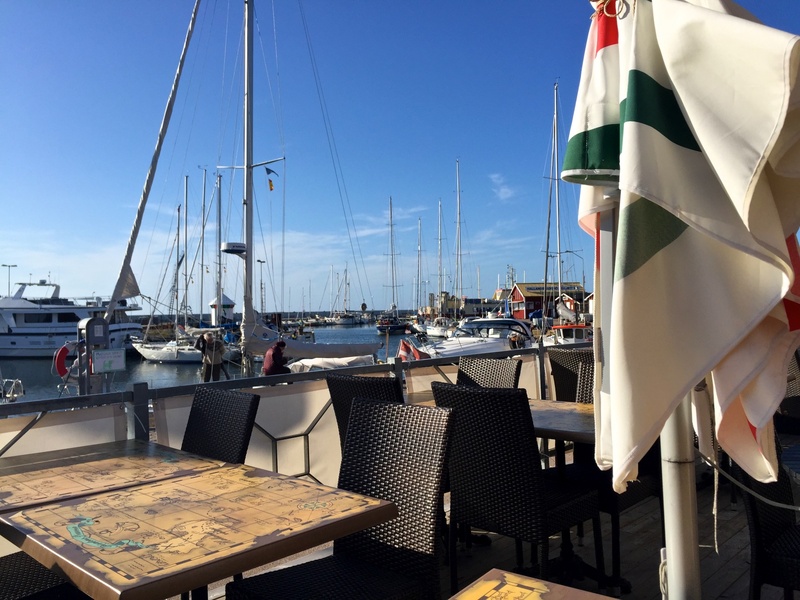 After a days walking we couldn’t resist and stopped for ice cream in the small marina. View over the Torekov marina. After the break we went looking for a place to pitch our tent but this would show to be harder than we first thought. 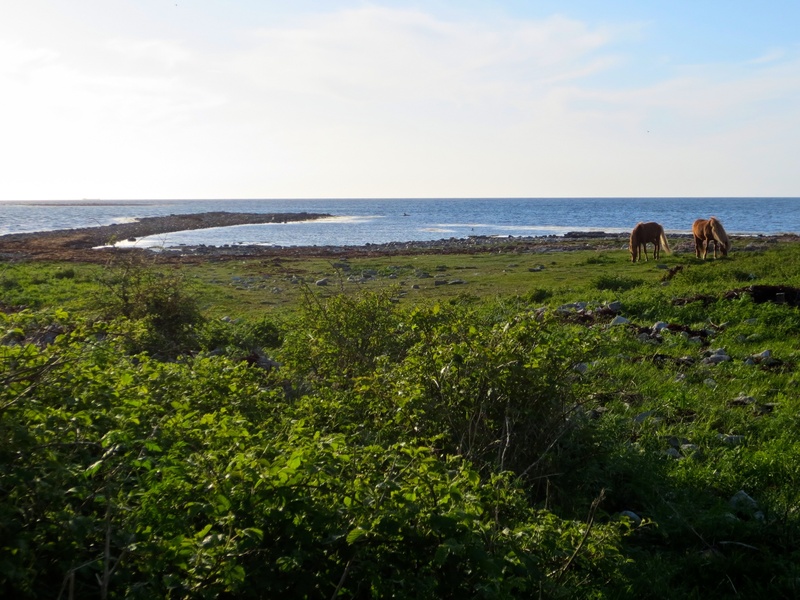 The main reason for this is that more or less all coastal area on Bjärehalvön consists of natural reserve areas, which means that camping is not allowed there. This is a general exemption to Allemansrätten and can be good to know if you are hiking in similar areas in Sweden. A couple of horses grazing by the seafront. Because of this we were left to try and find a campsite outside of the reserve. As much of the land close the reserve for obvious reasons is occupied by summer houses there was not very much space left for a tent close to the beach. 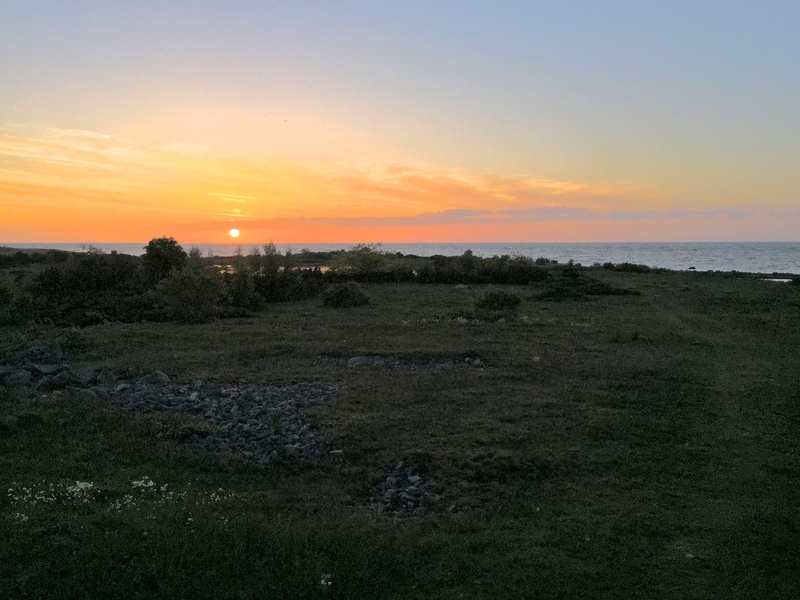 It took us several kilometers until we found a decent spot for the night, a small parking lot with a clear view over the sea. We had now walked over 33 kilometers and were both hungry and a bit tired. Our spot for the night. Andrés Ultamid overlooking the coast line of Bjärehalvön. This was the first time we pitched the Ultamid with the inner net. A Bear Pawwd net that André purchased last summer for our Jotunheimen trip. 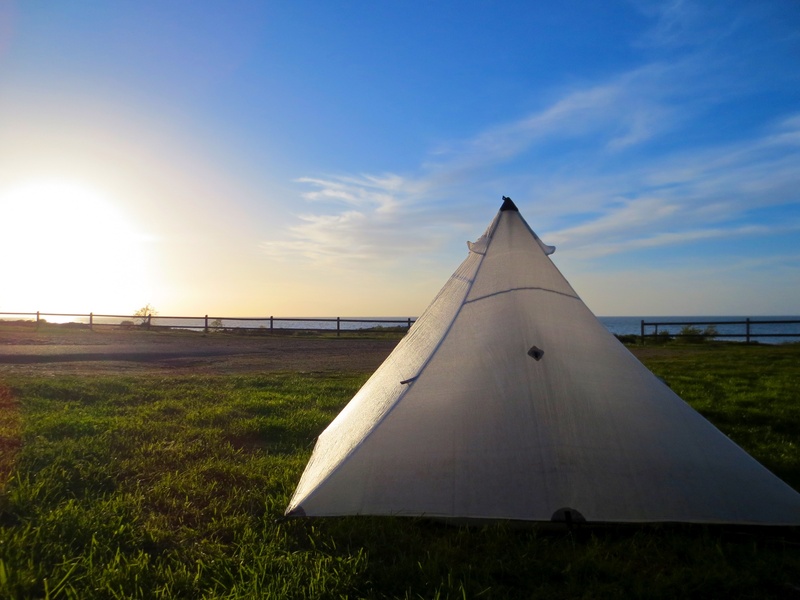 Back then we made a last-minute decision to ditch the inner in favor of our bivy bags, so the tent had stayed unused in Andrés storage until now. The inner net luckily showed to be a perfect fit for the Ultamid and we had no trouble at all fitting in both our sleeping mats and rest of our gear inside the tent. After this we made a quick meal and went to bed after a long days walk. Next morning we woke up early and started our journey towards Båstad. We soon passed a small harbour with colourful fishing huts. Next to the huts there was something looking like an old torpedo, probably also a remain from the war. We found an old water pump but to our disappointment we couldn’t get any water our of it. After this the trail led us up on higher ground and above Hovs Hallar. Actually the trail did not go through the area but stayed on the cliffs above. There were several paths leading down to the shore but we decided to stay on the high route and enjoy the view from above. The trail then took us inland through the woods and all the way up to the view-point at Knösen 152 meter above sea level. 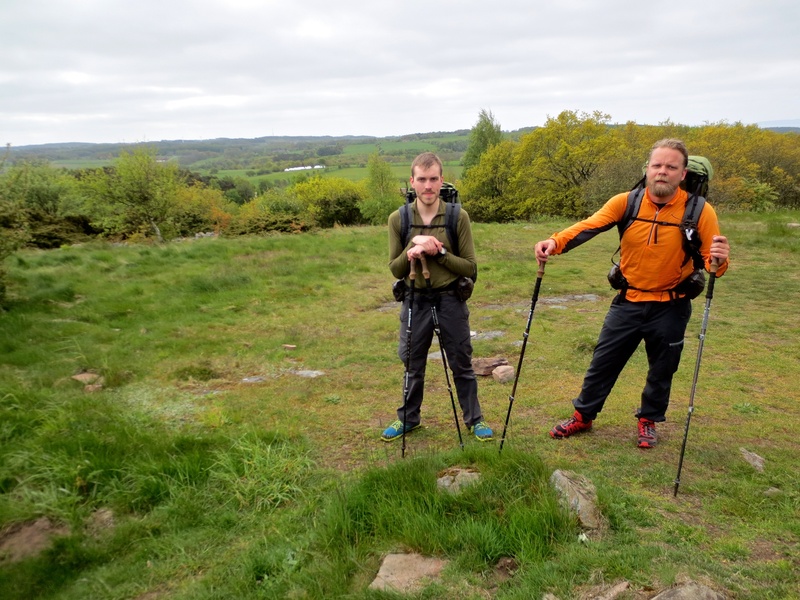 There we met two Danish hikers who just had packed their camp together and where heading for Torekov. From here the path led us downwards, through similar landscapes; beech wood, fields and farms. On our way we passed a number of couple of small creeks. By lunch we hade arrived at the sea side on Bjärehalvöns northern side, the rest of the walk was along a small gravel road frequented by walkers and cyclists. 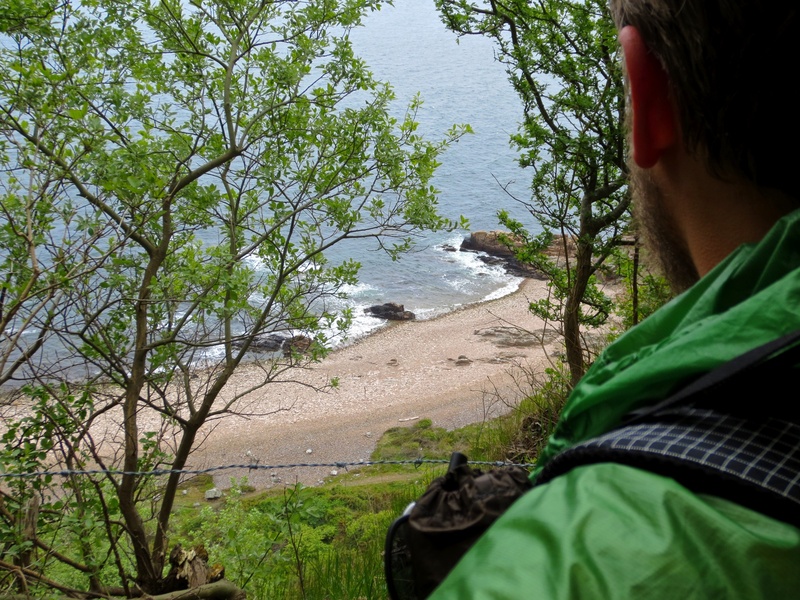 It took us about an hour to reach Båstad, by then we hade walked around 17 kilometers and we got in to the car and went for a quick-lunch before starting the journey home. All in all this was a surprisingly good trip, the trail showed to be nice with magnificent views along the walk. If you have the time we can really recommend a walk around Bjärehalvön! Selfie time during a short break, sheltered from the wind by an old bunker.